GeorgeTown (CNS): “Billy” and “Archie”, the two Blue Iguanas injured in a violent incident at the Queen Elizabeth Botanic Park on 3 May, have recovered and are no longer in need of veterinary attention, according to Fred Burton, Director of the Blue Iguana Recovery Programme (BIRP). 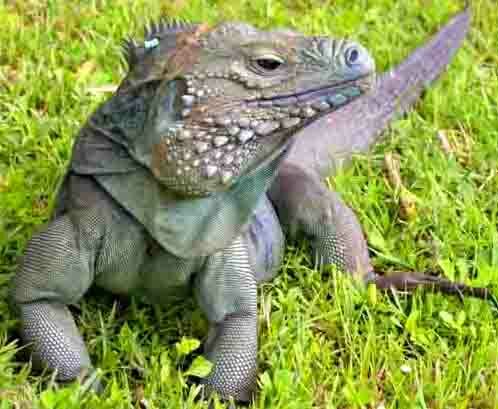 The attack, which police say may have involved dogs, resulted in the deaths of seven of the critically endangered Blue Iguanas from the Cayman Islands National Trust’s successful captive breeding programme at the Park. “On an upbeat note, we now have 91 fertile eggs under incubation, and more on the way, putting us comfortably into record territory for this year's impending Blue Iguana hatch,” said Burton. He added that yesterday (Tuesday), the Warden, John Marotta, with help from international volunteer Angela Gamber, excavated the nest of a female iguana, known as “Arlington”, and recovered six healthy eggs, sired by “Matthias”, one of the slaughtered iguanas. “So he will have offspring this year; he fertilized Arlington before he died,” Burton noted. Meanwhile, Sagicor General has made a donation of CI$5,000 to assist with the security needs of BIRP to help protect the remaining Blue Iguanas in captivity. “We hope our actions will inspire other businesses, big and small, to step up to the plate and join us in our stand against the violent attacks carried out on the Blue Iguanas,” said Ravi Kapoor, Marketing Manager of Sagicor General (Cayman). “We could not standby and witness the extinction of a species as unique as the Blue Iguana. Furthermore, they are truly and uniquely Caymanian and part of our heritage – Cayman’s Heritage,” said Danny Scott, President of Sagicor General Cayman. “Our review of the Blue Iguana Recovery Programme has shown that it is working successfully in bringing back (this) species from the edge of extinction. The death of so many endangered (animals) must not be allowed to occur again, and with the support of people and businesses in the Cayman Islands, we can ensure that it doesn’t,” he added. BIRP began in 1990 with a goal to secure wild, reproducing populations of the Grand Cayman Blue Iguana in protected areas, in such a way that their long-term future becomes secure without the need for constant human intervention. To date the programme has successfully introduced 220 Blue Iguanas into the Salina Reserve, including over 40 that were released in 2007.